Meetings are held the first and third Tuesday of the month; 12:15pm Location to be determined. 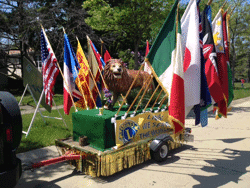 Welcome to the Lombard Lions website. 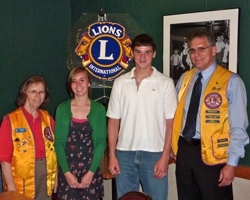 The Lombard Lions is a service organization of men and women, founded in 1923, with the principle “We Serve,” benefiting the sight and hearing impaired of the community. 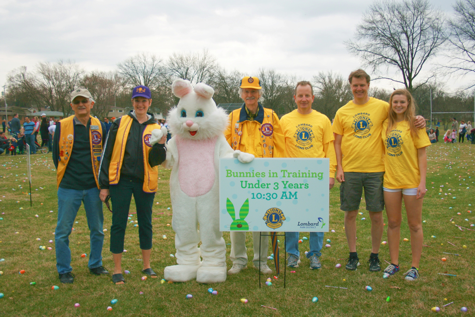 The Lombard Lions sponsor several fund raising events during the year, such as Candy Days (Sept), the Pancake Breakfast (Jan), White Cane Days (April) and selling refreshments at the Lilac Festival Parade (May) . They also collect used glasses, hearing aids and old keys for recycling. More About Lions. The Lombard Lions website aims to provide resources for the community with a strong emphasis on visually and hearing impaired services. 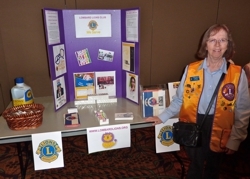 Web Resource Page You can contact them at: Lombard Lions Club, P.O. Box 431, Lombard, IL 60148, or send an email. For information on becoming a Lombard Lion, please fill out the web contact form. Lion Kay Sirek at the Visually Impaired Awareness Day sponsored by DCIL. For information on becoming a Lombard Lion, please fill out the web contact form. 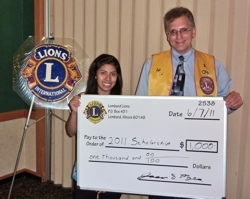 The Lombard Lions Club is a 501(c)(3) organization.